It’s my pleasure to be speaking at BGOUG and UKOUG again this year. The coming Wednesday 19th Oct, I’ll be speaking at the UKOUG Systems SIG event here in London (agenda). I’ll talk about Exadata implementations I did last year and issues I encountered. Also, things you need to keep in mind when you plan to extend the system, attach it to ZFS Storage Appliance or Exalytics. It’s this time of the year again when one of the biggest and last for the year Oracle User Groups is being held and that is UK Oracle User Group Conference. I’ve been involved in organising a couple of upcoming UKOUG events. I will be involved with the engineered systems stream for the annual UKOUG conference, returning after an absence of a couple of years, to once again being held in Birmingham. While the planning for this is at a very early stage, Martin Widlake will be giving you the inside scoop on this. 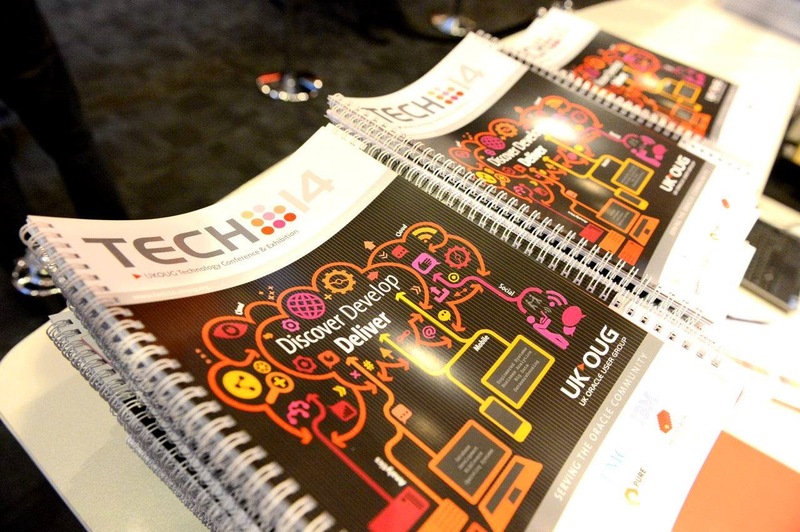 Last week I spent 4 days at the annual UK Oracle User Group conference, this time around called Tech14. It was my first UKOUG conference in a number of years and I set out with the intention of treating it like an all you can eat buffet of APEX presentations and workshops. I think 2 years is long enough to wait between posts! Today I delivered a session about Oracle Exadata Database Machine Best Practices and promised to post the slides for it (though no one asked about them :). I’ve also posted them to the Tech14 agenda as well. It’s been a while since I put anything on this blog, most likely down to a combination of being overly busy in my previous life at UKOUG and not having anything to say that couldn’t be said in 140 characters. A specialist is someone who knows a lot about a topic. He specializes and specializes and knows ever more about an ever smaller knowledge area. And in the end, he knows everything about nothing. First of all, a big Thank you to everyone who voted to keep me on the Board of Directors. I’m very grateful for all of the support and very pleased to be able to continue as a Director. UKOUG Director Elections – Please Vote! >There’s only a few days left for voting in this year’s Director Elections, with the process closing on February 28th. More information on the election process, including information on the role of Directors, and this years candidates can be found here. >This is the Conference Review Part 2, but I wanted to do a separate post for the IPA’s. On Tuesday night at the conference, we had the first ever UKOUG Inspiring Presentation Awards. >Well I finally made it back home from the UKOUG Conference in Birmingham, only a day and a half later than planned. Speaker Awards and a Pantomime…..
>Before you think this is something completely random (which it probably is) yes, I am indeed talking about this year’s UKOUG TEBS Conference. The Inspiring Presentation Awards (IPA’s) will be handed out for the first time at this year’s UKOUG Technology and E-Business Suite Conference. The UKOUG conference in Birmingham is over, and I have placed PDF files of my two presentations on the papers page. Did you know that ODTUG is podcasting? I hear a couple of podcasts on the way to work the other day, and they’re good. I encourage you to sign up at odtug.podhead.net.